Are the Sun and Moon both acting on El Nino events? As you can see, both Ian’s lunar hypothesis and my solar hypothesis fit pretty well. 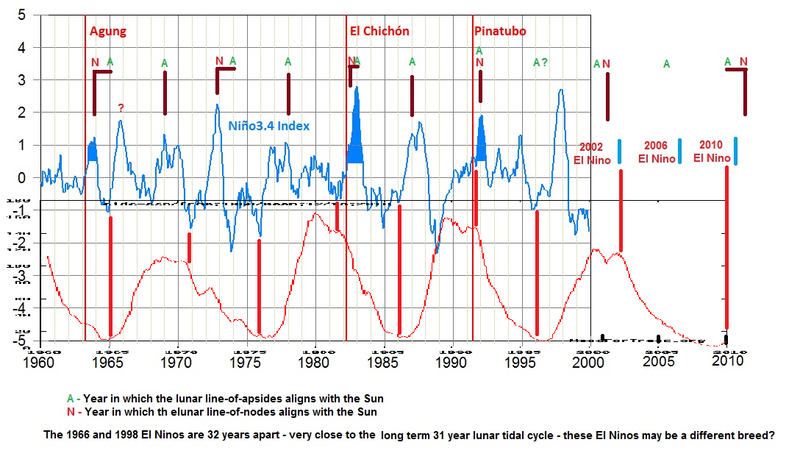 Ian’s series has two ‘?’ annotations at 1966 and 1996 which are both handled by my solar-El Nino hypothesis, and his Lunar points coincide near enough with the solar ones in most cases and additionally cover a few smaller El Nino events missed by my solar hypothesis; e.g. at 2006, 1963 and 1977. Could this connection be the result of the fact that if you plot the rate of change of the Earth’s Length of Day (LOD) [with the atmospheric component removed] against time [starting in 1962] you find that there is a ~ 6 year periodicity that is phase-locked with the 6 year period that it takes the lunar line-of-nodes aligns to re-align with the lunar line-of-apse? 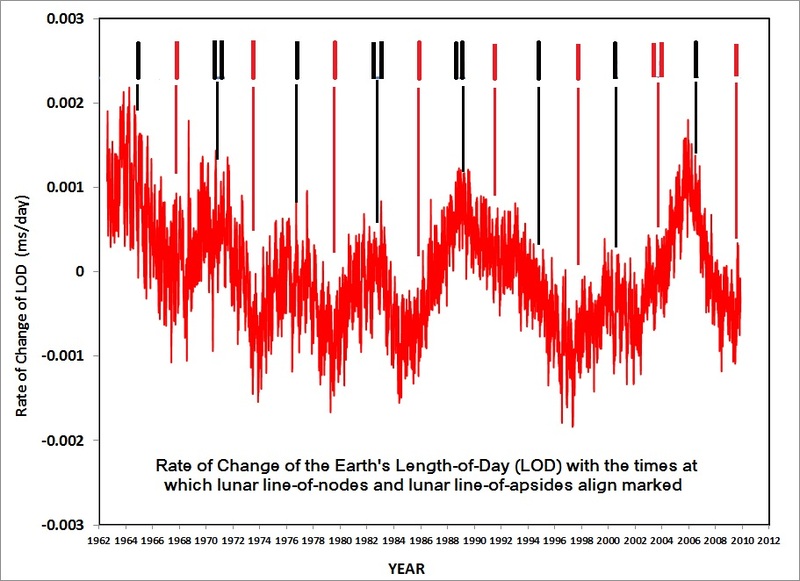 It seems likely these changes in Rate of change of Length of day are associated with tidally shifted ocean mass related to Lunar motion, so why not ENSO events too? Aided and abetted by changes in insolation over the solar cycle. Interesting paper on the effect of Lunar declination and Apse cycles on tidal height worldwide. I’ve taken the liberty of adding my Solar – El Nino hypothesis to it: the proposal is that El Nino tends to be initiated as the cycle starts to decline steeply and initiated again at solar minimum as it ‘bottom’s out’. What kind of ‘lag period’ could there be? You are taking the picture of the checkered flag in a race as being the cause of winning by 1/2 second, when the reason could have been the last pit stop was done by the winner was 3 seconds faster. Every weather event has a lag from the cause, be it hottest time of day, hottest day of year, lowest and highest polar ice extent. Figure the lag and get the cause. Better data sure leads to recognition of cycles, but there are also waves the cycles are riding. DDM: Thanks, It looks like around 1 year lag at solar minimum to me from the reversal to when the El-Nino really gets going. The Sun is the big energy provider, the Moon is the big ocean shifter. Together they make Enso swing. Again, thanks for the re-blog! As you say there is almost certainly a synergy between the solar and the lunar effects. It has often been noticed that mega-droughts in South Asia tend to occur much more often when the sunspot cycles switches off every 200 years or so. The mega-droughts in South Asia seem to be clustered in the slow decline in sunspot numbers after the initial drop in SSN. This would agree with your hypothesis that El Ninos [which are associated with the onset of mega-droughts in south Asia] are more common in the declining phase of sunspot number. My next paper, after the one I am currently just finishing, will show that that Proxigean Spring Tidal events are much more common in the year prior to, or the first year of El Nino events, than at other times. Suggesting a link between these two phenomenon. If there is sufficient data to allow it, I will see if the phase of teh solar cycle has an effect as well. Ian: If you’re around. Are the lunar cycle picks plotted on TB’s first graph correct to within, say, a month? If so they explain why El Niños tend to peak around Christmas (which is why they’re called El Niños). TB: Any idea why La Niñas tend to bottom out around Christmas too? It’s hard to see that as a purely solar effect. They are plotted to the nearest half year – if my memory serves me right. Your diagram shows the effect of lunar orbital configuration convincingly. It also indicates that another factor is the end of a solar minimum. The solar minimum sets the mousetrap and the first hint of the upswing of a new cycle trips it. Then a strong La Nina follows, and a series of decreasing ENSO cycles follows that. Possibly a pulse of UV during the onset of a new cycle is absorbed deeper in the ocean than normal, flattening the temperature profile and suppressing surface convection, which lets the El Nino get started. My thanks to Ian Wilson for his work on planetary spin-orbit coupling. This theory will eventually out. I’m intrigued by how the differential rotation of the sun follows the solar cycle. This would definitely be related to spin-orbit coupling. Does this alternating shear phenomenon lead to breaking of the toroidal lines of force on a periodic (11 year) cycle? Also, E.M. Smith’s work on orientation of tidal vectors and the 60 year cycle shows the gravitational influence of the sun/moon/earth triplet on the earth’s climate. All we need is for a few more scientists to quit delivering pablum to the politicians. With the international Ag cartel convincing politicians NOT to store grain that could be a real OH …! The Chinese on the other hand are busy buying land outside of Asia and stock piling food. The following quotes show the grain traders greed and the level of concern for other humans. The archaeologists and climatotologists document a rather grim history… There is considerable evidence that these empires may not have been undone by barbarian invaders but by climatic change…. has tied several of these declines to specific global cool periods, major and minor, that affected global atmospheric circulation and brought wave upon wave of drought to formerly rich agricultural lands. Refugees from these collapsing civilizations were often able to migrate to better lands… This would be of little comfort however,… The world is too densely populated and politically divided to accommodate mass migration…. It has been ~84 years since the Dust Bowl in the USA. Severe drought hit in 1931 and lasted till fall of 1939. Dr. Feynman found an 88 year rain fall pattern in the Nile river records. Meanwhile in the USA we cut down the trees in the shelterbelts, and ignore the other conservation methods, like grass filterstrips that resulted in a 65 percent reduction in the amount of soil blowing during the Dust Bowl decade. Roger A: Isn’t that distribution likely to have more to do with Earth’s perihelion being in early January? The swing across the annual cycle is around 80W/m^2 at the top of atmosphere in TSI terms. Southern SST’s are higher then anyway. TB: 80 w/sq m more TSI at perihelion would presumably cause warming and therefore could explain why Niños peak in January. But if TSI were the trigger we would expect Niñas to bottom out at aphelion in July, not in January. I’ve been searching the literature trying to find out whether anyone has an explanation for why both Niños and Niños reach peak amplitude in or around January, but haven’t found one. Do you know of anything? Roger A: It’s a good point, and a good puzzle. I’ll chew on it. i) The short term ENSO oscillation of 3 to 5 years. ii) The long term 60 year Pacific Multidecadal Oscillation – 30 years in positive warming phase with more energy released to the air and 30 years negative with less energy released to the air. iii) In the longer term (more than 60 years) a changing ocean heat content whereby more ocean heat boosts El Nino relative to La Nina and less ocean heat weakens El Nino relative to La Nina. I claim iii) as a consequence of solar variability affecting global cloudiness and thus the proportion of TSI able to enter the oceans. That leaves i) and ii) as potentially affected by lunar or other forces. I think i) is primed by unbalanced heating either side of the equator due to the cloud of the ITCZ being mostly north of the equator but then you can have lunar or other forces determining when the unbalanced heat injection is discharged across the Pacific and across the equator into the northern hemisphere. If you chaps can work out any lunar and other effects on the timing of ENSO and a lunar or other reason for the length of the 60 year cycle with its 30 year switchovers and then fit that with my broader solar perspective then that would come near to a complete solution. Hi Stephen. Sensible division of the phenomena I think. The saros is not an integer number of days, but contains the fraction of ⅓ of a day. Thus each successive eclipse in a saros series occurs about 8 hours later in the day. In the case of an eclipse of the Sun, this means that the region of visibility will shift westward about 120°, or about one third of the way around the globe, and the two eclipses will thus not be visible from the same place on Earth. In the case of an eclipse of the Moon, the next eclipse might still be visible from the same location as long as the Moon is above the horizon. Given three saros eclipse intervals, the local time of day of an eclipse will be nearly the same. 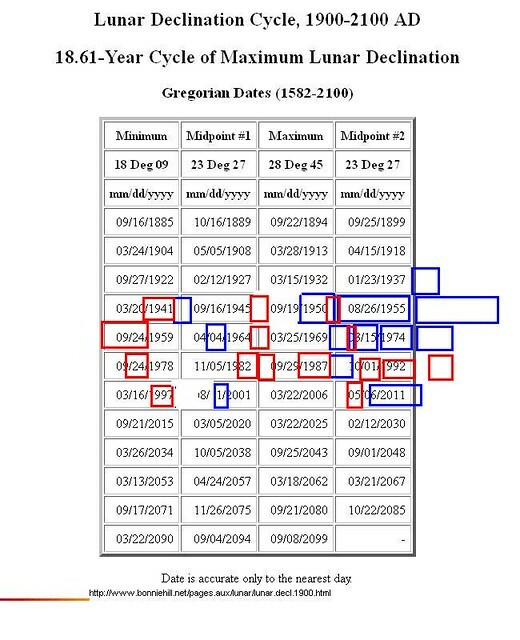 This three saros interval (19,755.96 days) is known as a triple saros or exeligmos (Greek: “turn of the wheel”) cycle. That’s 54 yrs and 34 days. 7 of those is 61.95 yrs. “ii) The long term 60 year Pacific Multidecadal Oscillation – 30 years in positive warming phase with more energy released to the air and 30 years negative with less energy released to the air. I think you’re turning things a little bit on their heads with these ones, Stephen. The ENSO process is the main mechanism for storage and release of energy in (and from) the earth system. It is not ‘more ocean heat’ that boosts El Niño relative to La Niña. It’s not like the ‘ocean heat’ is already there. It is the particular ENSO sequence that started rolling in 1970 and repeated itself again and again all the way up till today that is the most likely (some would say obvious) candidate for the period of global rise in OHC (also starting in 1970 with the big 1970-72 La Niña). The interesting thing is how the ENSO amplitude is so much larger on average post 1970 than before. The El Niños grew high and the La Niñas grew deep, though with multiple-year periods in between without big excursions. This is the sequence established. Both the giant ‘warm’ and the giant ‘cool’ events contributed to ‘global warming’, though in different (almost opposite) ways. The El Niños warmed the world from surface up. The La Niñas warmed the ocean (OHC), fuelling the Niños. I’m sure there’s a solar (& lunar) connection there. Which is why I find Tallbloke’s approach interesting. As Jean Dickey has shown us, QBO is the strongest frequency in ENSO. And it’s a no-brainer (that a lot of sleepy climate discussion participants somehow forget, maybe due to anomaly-think brainwashing) that the year is a big deal. It also ties in with what the 2 Rogers have been saying and illustrating in recent days, but the problem with rushed text-based online communication is that it’s so inefficient we could easily accidentally misunderstand one another without realizing a comment indicates dovetailing rather than objection. Illustrations forthcoming — meanwhile, keeping the conversation going with these hurried notes. This affects the stats summarized by Roger A. We need to be aware – (dovetailing, not objection). The break occurs in 1982, when the first in a sequence of super-Niñas begins. 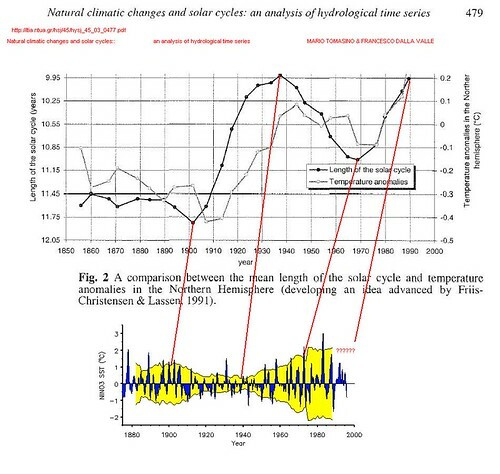 There were troughs in the Jose cycle in 1791 and 1969. Does the Jose cycle give the Earth a little punch? I don’t know. But…. this is really interesting stuff. from daily to secular. Annual Reviews Earth Planetary Science 16, 389-476. There’s a section on the 1969.5 impulse. Also… there is a section on a 61 year cycle of impulses (I believe by RG Currie). Roger A: Not so coincidentally, that’s when the solar cycles got really strong again after the low 1970’s cycle. El Chichon helped too maybe? I’ve summarized all the relevant data except for Ian’s lunar cycles on the first graph. I’ve stared at it for a long time without reaching any conclusions as to whether the correlation of volcanic eruptions with Niños is a coincidence or not. I get the impression that a lot of what we’re seeing is the Pacific Ocean sloshing back and forth, like water in a bathtub. I should probably add that I don’t think water sloshing around in the Pacific changes the basic concept that the ocean tends to gain heat on the upside of the solar cycle and release it on the downside, or that specific ENSO events are linked to lunar cycles. The ’98 El Nino started during the minimum at the end of cycle 22 not on the front of cycle 23. Your own plots tell you this. There’s a cycle in both the variance & the mean. The 11 year ENSO problem is not separate from the ~20 year problem. With temporally global summaries and shared cycles in the first 2 moments, there’s paradoxical (in the statistical sense) confounding. We can’t stop at a temporally-global summary. Also: We don’t have the power of a large sample working for us. The QBO puts big notches in the data that line up with the year (and it’s circulatory evolution) at intervals such as 19 & 64 years. With such short time series, this makes it difficult to settle on 19, 19.86, 21, 22, or something else in this range. (A single event of higher or lower amplitude near the time series ends could throw out the estimate.) With extra-careful work, we may have enough info to narrow the field of possibilities. The summaries need to be broken down cycle-by-cycle. Grouping across the entire length of the time series (i.e. temporally-global aggregation) is sure to be overlooking rich, useful info in a context where so few details (almost none) have been carefully worked out by the politically-deflected mainstream. I don’t know where I can find a sufficient chunk of free time to focus deeply, but I’m confident there’s enough multivariate info to successfully apply the process of elimination under ideal conditions. I’ve written these notes in a hurry, so there’s probably high potential for misunderstanding. Paul: Clear enough to me. I’m impressed by Ian’s finding for a longer cycle at higher latitudes and a subharmonic nearer the equator though. This fits with my understanding of the way resonances operate. TB: I found it interesting the way Ian framed that regionally, based on regional tides, suggesting it might not apply globally. You may recall that Ian suggests NPI (North Pacific Index) lines up with 19.86 (J-S). And remember Tsonis’ synchronization framework? I predict ongoing interest in this 18-22 year stuff (and how that necessarily affects 11 year summaries). Roger Andrews: A few days ago I noticed you mentioned MEI only goes back to 1950. Keep in mind that extended MEI goes back to 1870. I linked to it in the discussions a few days ago. Note especially !! !..that the month of MAY is what l term a month of decision where SOI goes either pos or neg . Longest and and shortest days.? Somewhere there at those time periods ( ~May and ~December there is a switch..
and all your other comments Gail about the world of commerce wanting more money at the expense of Human food security.. Yes. This is truly disgusting ..!!! They ( New world order/government) want to reduce the human population down to 1 billion. You will need a brandy after watching this!! No. this is not a Hollywood apocalypse movie. is it? [Reply] After I finished giggling I stopped the video at around minute two. I’ll be very curious to see what Roger Andrews & Tim Channon have to illustrate if they find time to take a careful look at MEI. Paul: got a link to your preferred dataset? I’m not sure “preferred” is how I’d describe it. What I “prefer” is to look at ensembles of empirical indices assembled by varying aggregation criteria. In ecology we encountered a lot of very serious small-sample problems where standard assumptions of statistical inference were for certain violated, especially due to naively false (implicit) assumptions about spatiotemporal organization. As a result, a tremendous amount of philosophical attention was devoted by leading thinkers to sampling & aggregation issues. My primary focus with climate explorations has evolved into helping those speculating about physics see better. It’s easy to see from following the climate discussion that the physicists & climate scientists are basing their speculation about physical mechanisms on patently false assumptions. To be frank: They’re in harsh denial. By investigating sampling & aggregation criteria it became clear that one of their most important core assumptions about solar-terrestrial-climate relations can be rigorously proven (in a mathematical sense) to be false. I gave a link to extended MEI from the SST EOF 1234 article I mentioned in the more recent SAM & Sun article. Some of the climate scientists will understand the multidecadal wind-driven vertical ocean heat mixing (which rips apart stratification) more readily when the westerly-driving equilibrium-disrupting equator-pole insolation-gradients are framed in terms of EOFs. IPO is an east-west feature that obscures our view of north-south features in small samples. If Tim Channon were to pinpoint the near-20 & near-60 year extended-MEI components as seen under the assumptions of his methods, I suspect it could help overcome a key misconception of climate scientists who understand EOFs. TB, I’m not sure if you see where I’m going, but I speculate that it will be possible to rigorously prove (in the mathematical sense) the 1920s phase-reversal to have been of simple spatial origin. Related (to 1920s beat node (see woodfortrees illustrations above)): I look forward to seeing Roger Andrews extend his explorations (if he decides to do so) to extended MEI, paying careful attention to how small-sample summaries vary with aggregation criteria. The big picture of climate simplicity may seem baffling to those not fully fathoming aggregate constraints from the laws of large numbers & conservation of angular momentum, but maybe there’s an alternate path of lesser resistance to enlightenment via extended MEI. What will it tell us (about spatial organization specifically) if Tim compares near-20 & near-60 year MEI components with those from hadcrut4? I hope we’ll find out as Talkshop explorations evolve over the coming weeks & months. Greed for wealth, greed for power and a hatred for the middle class that is challenging their position in society explains a lot of what is happening. A world government and a small population gives would be dictators more control. …In summary, we have record low grain inventories globally as we move into a new crop year. We have demand growing strongly. Which means that going forward even small crop failures are going to drive grain prices to record levels. As an investor, we continue to find these long term trends – and this niche – very attractive. Gail. I guess we are off topic here. Catch u non another thread on this topic one day and thanks for your many wonderful links from this blog. This is what many governments are recommending we progress to. Regarding the possible coming Cold phase and failed monsoons, increased volcanes etc in the coming decades. Of note this week in the world news is the call out to ALL governments around the world from WORLD head office ..to prepare for disaster management. ( google: Are you ready?) They are concerned about mass migrations across borders. We have something on in Australia as well. TB might check that out for an interesting new post.. politics/disaster management. What do they know they are NOT telling the public ?! ….. TB might check that out for an interesting new post.. politics/disaster management. Unfortunately science is only 1/2 what we have to worry about in the Climate Wars. I had time to run some checks using wavelets & gaussian second order central differencing. Tim looked at hadcrut4. I took a look at ERSSTv3b2 & HadSST3. After trimming off edge effects, I ended up with an estimate of 20.22 years. I checked the average solar cycle length over the edge-effect-trimmed record summaries: 21.61 years. The harmonic mean with QBO-year alignments is exactly 20.22 years and a Chandler wobble flip would be expected in 79 years (check the simple beat calculations to see when the event series slip would be expected) via shift on the semi-annual framework (as I’ve pointed out before, quite some time ago (I think only Oliver Manuel noticed)). This is exactly what’s observed and this gives a tight fit with the SAOT tower book ends. This solves 4 longstanding puzzles in one clean shot. The solution was simple, as I always knew it would be. I just rescued it from spam and approved it before you commented. No idea why it went there. To clarify: I don’t mean 79 years from now. Edit: bottom’s out — bottoms out. It’s also the Metonic cycle length.